Toby has been working a lot lately. I was starting to wonder if I still had a husband. The good news is, the project is wrapping up. I’m excited for obvious reasons—I get my (weekend) husband back. But I’m also excited because I finally get to share the project with everyone! 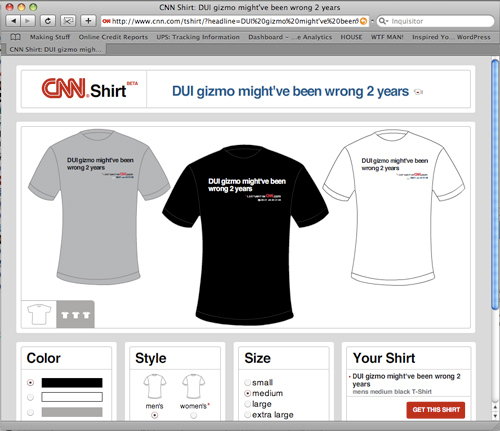 The Barbarian Group worked with CNN and created a pretty awesome campaign and system for taking select (video) headlines and turning them into t-shirts. (You get to the page shown above by clicking one of the small t-shirt icon on the homepage next to some of the latest headlines.) I can’t tell you how awesome I think this idea is. Plus, the design is remarkably clean. Go check it out if you have time. Previous Post Top Chef Chicago: No Spice. Next Post One Year Without You.